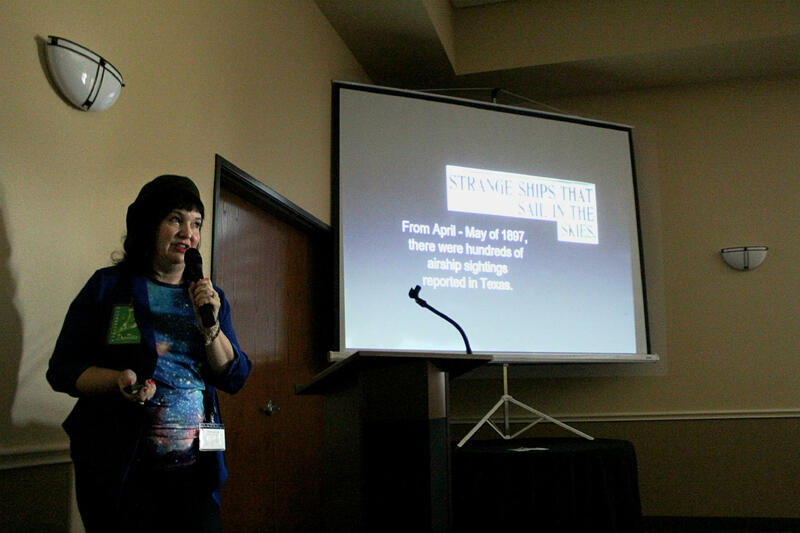 Author Tui Snyder gave a presentation on the numerous reports of mysterious airship sightings in Texas in the spring of 1897. A cigar-shaped airship was seen falling from the sky when it crashed through a windmill and exploded. The airship, it is said, was not of this world. The pilot – from Mars, people thought at the time – was allegedly buried with Christian rites at the nearby Aurora Cemetery. The Wise County town recently hosted a conference to commemorate the UFO crash. Folks have different opinions about what happened nearly 120 years ago. Toni Wheeler first heard the story of the crash when she was a kid growing up in Aurora. An older neighbor would sit on his porch and tell stories. Many folks in Aurora call the alien Ned. He's the extra-terrestrial pilot that is said to have been buried in in the town. Wheeler came up with the name -- and it stuck. On Saturday, Wheeler spent the day leading bus trips to the crash site and the old town cemetery. It was part of the Aurora Alien Encounter conference she helped organize. Researchers have looked into the story for years, testing water in the well where the wreckage was said to be stored, digging metal out of trees at the crash site as proof something exploded, and using radar to see if there really is a Ned in Ned’s grave. In the 1970s, Wheeler says people even tried to exhume the remains. 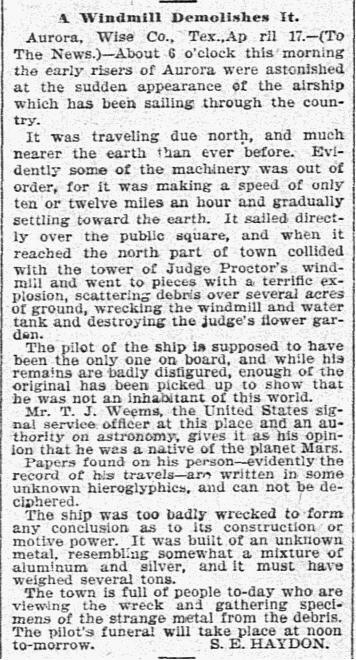 This wasn’t the only UFO sighting in Texas in the spring of 1897. New telescope technology had allowed people to see the face of Mars more clearly than ever, though maybe not quite clearly enough. An Italian astronomer in 1888 announced he’d seen evidence of canals on the red planet. “Papers found on his on his person – evidently a record of his travels – are written in some unknown hieroglyphics, and cannot be deciphered," the newspaper reported. There were lots of theories about what happened back in 1897. There still are. Some thought it was a man-made dirigible that crashed, others called it a hoax. Some at the time saw it as a sign of Judgment Day approaching. These days, in Aurora, there’s more tension over whether the city should embrace the alien story. The conference is just one way the town is cashing in on its lore. There are plans for an alien-themed haunted house this fall. A statue is in the works -- featuring a broken windmill and the flying saucer Ned crashed. Smith says she was pleased with the conference’s turnout. The venue, she said, was at capacity. Conference organizers say they want this to be a yearly tradition. Like a lot of attendees, Richard Wall says he’s had his own UFO encounter. Several years back, he says he saw glowing spheres in the night sky that flew off with a sonic boom. As for the 1897 crash, though, Wall is skeptical. “I’m sure somebody saw something, and they’re trying to make something plausible of the story behind what they saw,” he says. His wife, Dolly Moravitz- Wall, shook her head at her husband’s disbelief. The two together share the views that so many people who turned out to learn more about the event: That even if Ned didn’t crash land in Aurora in 1897, it doesn’t mean Ned’s cousins aren’t out there.